• Can an informal alliance of global investors achieve their aim of establishing a new set of norms around climate risk reporting and disclosure? • With European investors and corporations broadly backing calls for improved climate risk reporting and disclosure, is this the moment we will see North America come on board? • Will this resolution end the apparent inconsistency by asset owners and asset managers who vote for climate risk resolutions when supported by management but not when companies resist? 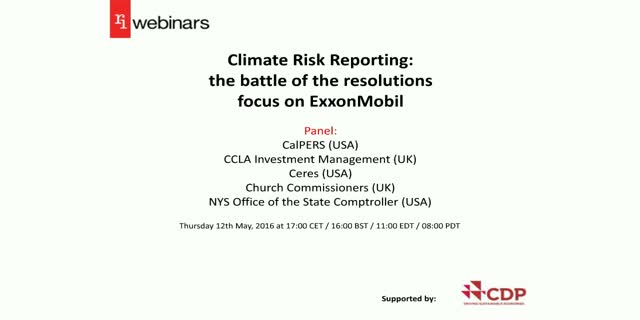 Stockholder Proposal Regarding Report on Climate Change Impact Assessment is Item No 12 on the ballot at ExxonMobil’s AGM on 25 May. It has been co-filed by England’s Church Commissioners and the New York State Common Retirement Fund in the US. This transatlantic partnership is a first for the Church Commissioners. The resolution asks ExxonMobil to improve its annual reporting on climate risk and to disclose to investors how resilient the company’s portfolio would be if efforts to restrict warming to 2° were successful. In an article written by Edward Mason for Responsible Investor link, he explains that their resolution doesn’t ask ExxonMobil to change its house view that the 2° target will be overshot. It simply asks them to report on how the business would fare were the Paris Agreement to be implemented. It is the same request for reporting on portfolio resilience that the “Aiming for A” shareholder resolutions made of BP and Shell in 2015.